In the early months of 2010, the economy was starting to show signs of life after the recession. Then Congress passed the president?s health-overhaul law. Debate over the ObamaCare law?s potential impact on hiring and the economy has been fierce from the start. The president promised it would be a boon to both; then-Speaker Nancy Pelosi said the law would create 400,000 jobs ?almost immediately.? Others argued the law would make businesses much less likely to hire new workers. That debate should now be over. The Heritage Foundation?s James Sherk recently released a paper comparing the rate of net job growth before and after the passage of ObamaCare in March 2010. The findings show that job creation came to a screeching halt at the time ObamaCare was enacted. The low point of the recession came in January 2009, when US employers shed 841,000 jobs in just that one month. But the economy slowly started to recover over the next 15 months; private employers began hiring workers at an average rate of 67,600 per month (net of layoffs). The economy?s high point came with the April 2010 report, when 229,000 jobs were added. 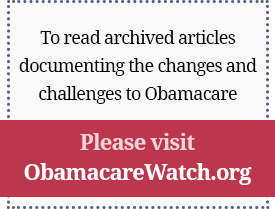 But ObamaCare was signed into law in late March, and the hiring freeze began. In the following months, the economy added an average of just 6,500 jobs per month (net of layoffs) — less than a tenth the pre-ObamaCare average. This doesn?t prove that the health law is a major cause of the problem. But there is no question that the jobs recovery stalled after ObamaCare passed. A new jobs report is due out tomorrow, but yesterday?s preliminary estimates from the payroll company Automatic Data Processing are that the number of new jobs created last month fell far short of what?s needed just to keep up with number of new people entering the workforce. And there?s good reason to believe that the health law is a major contributor to the hiring halt. In a recent US Chamber of Commerce study, 33 percent of business owners cited Obama–Care as either the biggest or second-biggest reason they?re not hiring new workers. Those findings were backed up by the words of Dennis Lockhart, president of the Federal Reserve Bank of Atlanta, in a speech earlier this summer: ?We?ve frequently heard strong comments to the effect of ?My company won?t hire a single additional worker until we know what health-insurance costs are going to be.? ? How does ObamaCare discourage hiring? First, it adds unknown costs to hiring new workers. Companies already must consider the cost of taxes for Social Security, Medicare, unemployment insurance and workers? compensation when hiring new staff. combined with health benefits, these costs explain why a $50,000-a-year employee costs a company $62,500 to $70,000 (according to MIT business professor Joseph Hadzima). ObamaCare adds new costs by forcing employers to either provide workers with expensive, government-approved insurance or pay a fine. The health law also discourages small businesses from becoming mid-size businesses because the mandate to provide insurance kicks in once you reach 50 or more employees. This is profoundly wrongheaded. Small business is the engine for job growth in America, but a recent survey found that 70 percent have no plans to increase hiring in the next year. As for those companies that already have 50 or more workers, the burden of having to buy expensive government-approved policies (or pay penalties) discourages them from hiring all but essential staff. Indeed, larger companies are doing everything they can to pare back on entry-level jobs and using automation to avoid the added cost of mandatory health insurance for lower-income workers. McDonald?s and CVS drug stores, for example, are replacing some human order-takers and cashiers with electronic systems. This especially hurts entry-level would-be workers who need jobs so they can get the skills to enter the workforce. Is it any surprise that teen unemployment has now hit 25 percent? The jobs they need are evaporating because of ObamaCare. The evidence now is clear that ObamaCare is discouraging employers from hiring. The question is how long the president will continue to sacrifice the economy for the sake of his signature legislation. Published in the New York Post, September 1, 2011. In the early months of 2010, the economy was starting to show signs of life after the recession. Then Congress passed the president’s health-overhaul law. Debate over the ObamaCare law’s potential impact on hiring and the economy has been fierce from the start. The president promised it would be a boon to both; then-Speaker Nancy Pelosi said the law would create 400,000 jobs “almost immediately.” Others argued the law would make businesses much less likely to hire new workers. The Heritage Foundation’s James Sherk recently released a paper comparing the rate of net job growth before and after the passage of ObamaCare in March 2010. The findings show that job creation came to a screeching halt at the time ObamaCare was enacted. The low point of the recession came in January 2009, when US employers shed 841,000 jobs in just that one month. But the economy slowly started to recover over the next 15 months; private employers began hiring workers at an average rate of 67,600 per month (net of layoffs). The economy’s high point came with the April 2010 report, when 229,000 jobs were added. This doesn’t prove that the health law is a major cause of the problem. But there is no question that the jobs recovery stalled after ObamaCare passed. A new jobs report is due out tomorrow, but yesterday’s preliminary estimates from the payroll company Automatic Data Processing are that the number of new jobs created last month fell far short of what’s needed just to keep up with number of new people entering the workforce. And there’s good reason to believe that the health law is a major contributor to the hiring halt. In a recent US Chamber of Commerce study, 33 percent of business owners cited Obama–Care as either the biggest or second-biggest reason they’re not hiring new workers. First, it adds unknown costs to hiring new workers. Companies already must consider the cost of taxes for Social Security, Medicare, unemployment insurance and workers’ compensation when hiring new staff. combined with health benefits, these costs explain why a $50,000-a-year employee costs a company $62,500 to $70,000 (according to MIT business professor Joseph Hadzima). ObamaCare adds new costs by forcing employers to either provide workers with expensive, government-approved insurance or pay a fine. As for those companies that already have 50 or more workers, the burden of having to buy expensive government-approved policies (or pay penalties) discourages them from hiring all but essential staff. Indeed, larger companies are doing everything they can to pare back on entry-level jobs and using automation to avoid the added cost of mandatory health insurance for lower-income workers. McDonald’s and CVS drug stores, for example, are replacing some human order-takers and cashiers with electronic systems.